This issue of Constellis’ Kidnap for Ransom Insight Report covers global kidnapping incidents and trends over the months of July, August and September 2018. The information is derived from multi-source analysis of kidnap for ransom activity and where known, the outcome or resolution of the event. The report covers current kidnap for ransom hotspots at the regional, national and provincial level, with particular focus on areas where K&R activity is increasing. Statistical analysis of data for July and August 2018 is included on page 13, which graphically displays K&R trends by region, victims by nationality and employment sector, as well as identifying the Top 10 countries for kidnapping of foreign nationals over the reporting period. The Global Piracy Update provides an overview of the piracy threat by region, providing trend analysis for July and August 2018. It also offers sample cases occurring through those months, providing an illustration of the identified trends. The Cyber Security section examines current issues affecting companies and individuals in the realm of IT security. This edition will look at the rise of cryptomalware. As cryptocurrencies continue to proliferate and gain in popularity, cybercriminals are increasingly trying to surreptitiously ‘mine’ cryptocurrency from victims’ devices. By maliciously breaching users’ devices with cryptomalware, hackers are able to hijack the device’s processing power to mine cryptocurrency without the victim’s knowledge or approval. Due to cryptomining being a computationally intensive process, cryptomalware can severely degrade the performance of an infected device, as well as requiring a large amount of electricity. This can have a severe financial impact on breached organisations, with losses in productivity due to poor computer performance, as well as extremely high energy bills. 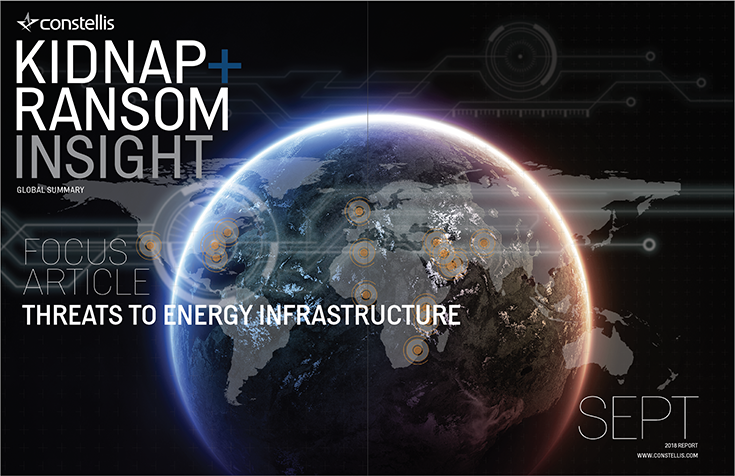 The Focus Article offers an insight onto the threats to energy infrastructure. Among all sectors that constitute a nation’s critical infrastructure, the energy sector is uniquely important because it possesses an enabling function across all other sectors. This not only means that its incapacitation or destruction would have a serious effect on a nation’s economy and security, but also makes it a high-profile target for threat groups. In the context of a complex operating environment with ever-evolving threats, both physical and virtual, it is necessary to utilise comprehensive approaches to security. Moreover, as an increasing number of critical infrastructure assets are privately owned, these approaches need to reflect the shared responsibility between the state and individual owners and operators.